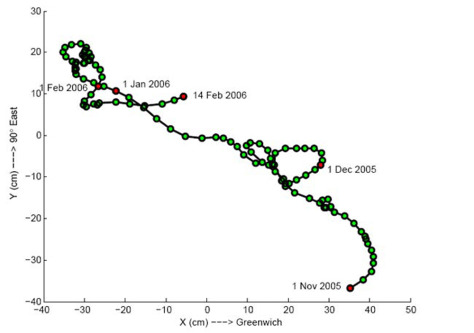 Motion of the North Pole, as determined by the IERS Earth Orientation Parameter Center of the Paris Observatory, for the study period, 1 November 2005 to 14 February 2006. Each marker represents the position of the pole on one day. Five loops are identified. Never before have these small polar movements been traced with such precision.